You will be picked from your hotel and head south to Amboseli National Park, right on the border with Tanzania. This park affords everyone's classic image of East Africa - herds of great animals moving across the dusty plains with the snow-capped peak of Kilimanjaro rising straight up in the background. Mount Kilimanjaro is Africa's highest mountain at 19,340 feet (5,895 metres)Arrive for lunch at the Lodge/ Camp followed by an afternoon game drive. Overnight at Amboseli Sopa / Amboseli Serena / Oltukai Lodge / Tortilis Camp. After breakfast drive from the flat plains and swamps of Amboseli travel east to Tsavo West National Park. Outside the park gates are the Shetani Lava Flows, "frozen" rivers of molten black rock twisted in bizarre shapes. 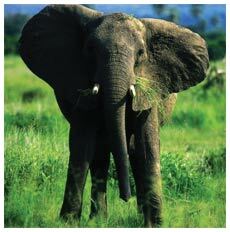 At just over 7,800 square miles (20,000 sq Km), Tsavo is Kenya's largest national park. The park is home to a huge variety of animals and birds, especially around the watering holes in this otherwise dry area. During the fall these watering holes are a stopover for hundreds of thousands of birds on their annual migration south. The Mzima Springs are the source of the freshwater pools much favored by Hippos and crocodiles. There is even a glass wall for viewing the pools from under the water line. Wildlife which can be spotted in this area includes lions, cheetahs, leopards, hyenas, jackals, giraffes, zebras, buffalos, baboons and several species of antelope. Dinner and overnight at Kilaguni Serena / Finch Hatton’s Camp / Ngulia Lodge. Day 04: Tsavo West –Nairobi. Breakfast followed by a Morning game drive enroute to Nairobi. Arrive for Lunch Carnivore Restaurant / Pampa Restaurant.